To help you determine whether your exposure settings are where you want them in M (manual) exposure mode on your Nikon D3100, the camera displays an exposure meter in the viewfinder and Shooting Info display. The meter is a little linear graphic that indicates whether your current settings will properly expose the image. The minus-sign end of the meter represents underexposure; the plus sign, overexposure. So if the little notches on the meter fall to the right of 0, the image will be underexposed. If the indicator moves to the left of 0, the image will be overexposed. The farther the indicator moves toward the plus or minus sign, the greater the potential problem. When the meter shows a balanced exposure, you’re good to go. Keep in mind that the meter’s suggestion on exposure may not always be the one you want to follow. For example, you may want to shoot a backlit subject in silhouette, in which case you want that subject to be underexposed. In other words, the meter is a guide, not a dictator. 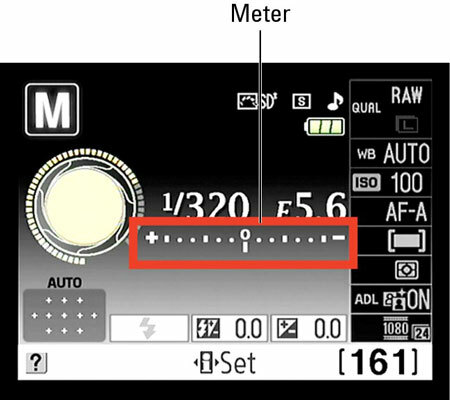 In addition, remember that the exposure information the meter reports is based on the exposure metering mode, which determines which part of the frame the camera considers when calculating exposure. 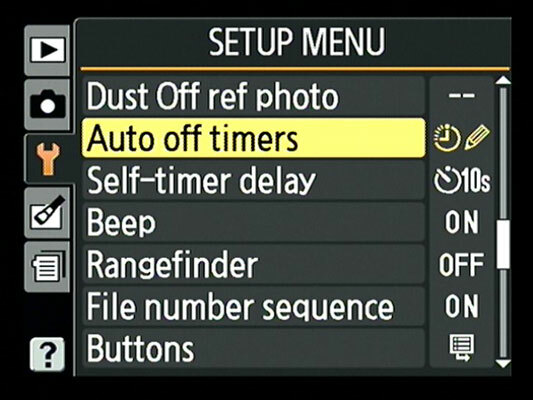 At the default setting, exposure is based on the entire frame, but you can select two other metering modes. Display the Setup menu, choose the Auto Off Timers option and press OK. Select Custom and press OK again. The Custom choice enables you to adjust the meter shutdown without also affecting the shutoff timing of the image-review and playback/menu displays. Highlight Auto Meter-Off and press OK.
You see the screen listing the available settings, which range from 4 seconds to 30 minutes. Select the timing option you want to use and press OK.
Keep in mind that shorter delay times conserve battery power. Highlight Done and press OK.